Celebration Park (701 Angel Pkwy, Allen) Kids eyes will light up when they see this park. It's huge. There is a very large Kid Mania built play structure, spray park, numerous sports fields, paved trails to walk or bike, pond with ducks, and restrooms. Green Park (1305 Comanche, Allen) This park is great for little ones. It's a first responders theme and has a firetruck, police car, police station, and ambulance. Pavilion and picnic tables too. The Fields at Carrollton Parkway (1401 Carrollton Pkwy, Carrollton) Another park that has it all. 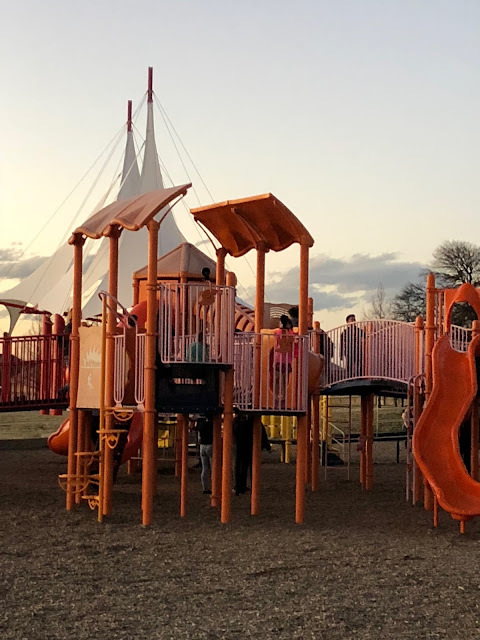 Two playground structures, splash park, hike/bike trails, restrooms, sand volley ball courts, numerous sports fields, pavilion, and concession stands. Mary Heads Carter Park (2320 Heads Ln, Carrollton) Fun play structures! A pirate ship and lots of slides. Restrooms,walking/biking trails, and a pond. Northeast Community Park (2895 Honey Grove Dr. Frisco) Not only does this park have a fun playground, it also has a skate park. Walking trails, a pond, and future plans to expand with a splash park. Little Elm Park (701 W Eldorado Pkwy, Little Elm) This is our favorite park because it has it all. Great playground with two zip lines, lots of trails to walk, BBQ grills, picnic tables, sand volleyball courts, great place to feed the ducks, and a sandy beach to play and swim. There is also public access to launch your boat or jet ski and you can rent paddle boards and kayaks from DFW Surf Little Elm Beach. Beard Park (310 E. Eldorado Pkwy. Little Elm) Another one of our personal favorites. Fun structures all on soft turf. Restrooms, music features, and you can take walk or bike the trail to Hula Hutt for a fun dining experience. And don't forget to try the Kawakini Stuffed Avocado while at Hula Hutt. McCord Park (FM 423 just north of Main St. Little Elm) Nice playground for all ages in an open area, new splash pad (1001 Witt Rd), disc golf, and over a mile of paved trails. They also have plans to open a dog park here in the future. Al Ruschhaupt Park (Phase 1:1986 Park View Ave. and Phase 2:2701 Northbrook Dr. McKinney) Great play structure that is also boundless (wheelchair accessible), splash pad, hike/bike trails, restrooms, many sports fields, large picnic shelter, and amphitheater. Jack Carter Park (2800 Maumelle Dr., Plano) A fun, all inclusive playground, walk/bike trails, restrooms, pavilion, pond, and sand volleyball courts. The Jack Carter Pool is not too far away from the park either and boasts pools, water slides, lazy river, Flow-Rider Surf Simulator and more! Arbor Hills Nature Preserve (6701 W Parker Rd Plano) This is actually my favorite place to hike in the area. You almost forget that you are just minutes from the DNT (Dallas North Tollway). You can hike in the woods or on their paved trail, and they also have a creek to splash in. They playground is nice and they have restrooms. Kids Kingdom (5300 Main St. Rowlett) Another huge park with a ton to do! Fun play structure with zip lines, dinosaur bones in a sandpit, trails,and restrooms. Frank Kent's Dream Park Fort Worth An all abilities playground on 57,000 sq ft that will be fenced in. This park looks amazing! Have I forgot any other great playgrounds? Leave a comment and let me know! Happy playing!